← Better Choices, Good or Yucky? Some of the ingredients for the pie we make! Combine flour, ground oats, agave, and salt in medium bowl. Cut in butter with a pastry blender or two knives until mixture is crumbly. Sprinkle with water; blend together with a fork until mixture holds together. Shape dough into ball; place on lightly floured sheet of wax paper. Top with additional piece of wax paper; roll out dough to 1/8- inch thickness. Remove top sheet of wax paper and invert dough into 9-inch pie dish, slowly peel away wax paper. Trim excess crust and turn edge under – crimp as desired. Melt butter in saucepan. Stir in flour and form paste. Add water, agave and brown sugar, and bring to a boil. Reduce temp and let simmer. Fill pan with crust with sliced apples, mounded slightly. Pour liquid over apples and top with crust. Bake 15 minutes in preheated oven, then lower temp to 350 degrees. Continue baking for 35-45 minutes, until apples are soft, and crust is browned. 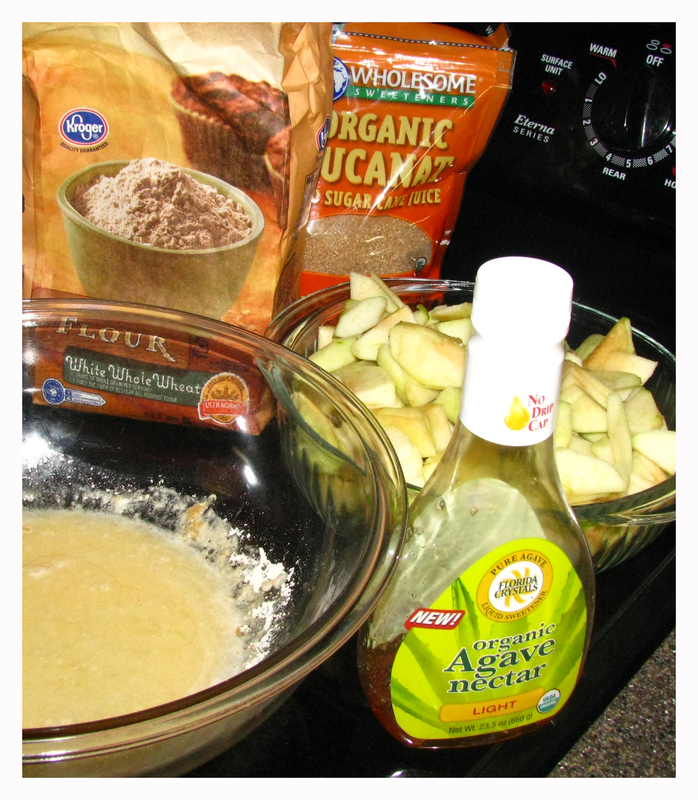 Posted on August 8, 2011, in Food To Try, Label Reading, Truth and tagged gestational diabetes, healthier apple pie, healthy eating, healthy for God, healthy for him, type II diabetes, worship in body. Bookmark the permalink. 3 Comments. Well you’re supposed to use 2/3 cup of agave for one cup of white sugar, and I was honestly concerned about it being “too runny” in some things (like mixing it with cream cheese), but it hasn’t been an issue. If a recipe calls for both brown and white sugar, I substitute like above (sucanat for brown, and agave for white). The sucanat says “organic brown sugar” and has more of a molasses taste – but can be used as a white substitute if color doesn’t matter to you. While the sucanat looks grainy – it dissolves quickly just like normal sugar.